Scientists have taken an important step towards understanding the biological processes involved when cells die. The Medical Research Council Toxicology Unit team hopes the work will eventually led to new treatment for a range of diseases, including cancer. They believe it should be possible to manipulate the complex interactions within a cell that lead to its death - and which often go wrong in disease. The challenge now is to use this knowledge to work towards finding new drugs and treatments for the many common diseases and conditions which occur when cell death goes wrong. Cells in the human body are continually dying and most of these cells kill themselves by a programmed form of cell death, known as apoptosis. In a healthy body, the number of cells stays constant. Millions of new cells are produced every second, and millions of others are lost or kill themselves. Failure of the normal apoptosis process plays a role in different diseases including cancer, certain neurodegenerative disorders such as Parkinson's and auto-immune diseases, such as lupus. Previous research has shown that the life cycle of a cell is regulated by a complex cellular machine called the proteasome. 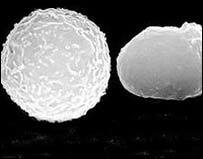 This works by controlling the delicate balance of proteins in a cell. Proteins which are no longer needed are tagged, and targeted for destruction by the proteasome. However, during apoptosis, the part of the proteasome which is able to spot the tags is effectively disabled by the release of enzymes called caspases. This allows for the build up of proteins within the cell which can ultimately trigger its death. The Leicester team hope that pinpointing this procedure will enable scientists to find ways to manipulate it to treat disease. For instance, amplifying the apoptosis process could potentially stop cancer, which often results from a failure of cells to die off at the end of their natural life. Lead researcher Professor Gerald Cohen, who is based at Leicester University, said: "This new research takes us a step closer to understanding how cells die. "The challenge now is to use this knowledge to work towards finding new drugs and treatments for the many common diseases and conditions which occur when cell death goes wrong." Dr Julie Sharp, science information manager at Cancer Research UK, said: "In the future scientists may be able to use this information to design treatments that switch cell death back on, stopping cancer cells in their tracks." Linda Kelly, chief executive of the Parkinson's Disease Society, said: "The society welcomes this new advance which will take us closer to understanding why cells die. "We look forward to future work in this important area of research."